If your company name or software has "SuperEasy" anywhere in its title, your products had darn well better live up to both words. 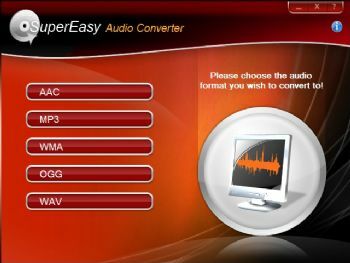 SuperEasy Audio Converter (various pricing, free 40-day trial) is simple and relatively easy to use, but alas, the ease does not attain "super" levels. Having to retreat to the launch page to change the audio output format is a pain, as is not being able to resize the interface to see all the information about a loaded file. Not being able to pause, only cancel an operation is another minus, and the lack of an automatic renaming of files in case of conflicts could stall unattended operations. Even though the interface doesn't quite live up to its name, SuperEasy Audio Converter is very good at what it does. The program converts existing audio files and in addition rips audio streams from videos. You can add existing local video files to the conversion queue, or you may paste a URL into the download dialog and the program will download Web content for you. The download dialog contains links to some of the more popular free content sites such as Dailymotion, MySpace, YouTube, etc. SuperEasy Audio Converter's input audio file types include AAC, MP4, M4A MP3, WMA, OGG, WAV and the program will also load VOB, XviD, DivX, Nero Digital, AVCHD, WMV, MPEG1 MPEG2, MPEG4, h.264, 3GP or MP4 (most types), and FLV video. The program can output to AAC, MP3, WMA (compressed and lossless), OGG Vorbis, and WAV audio formats. While SuperEasy Audio Converter worked with nearly all the supported files, it complained that there was no audio stream available for several of the standard wave files which load and play just fine in every other conversion program I've used. Then it loaded a similar file just fine. The company didn't respond to me in time for this review, however, I'm sure that once they understand the problem, most likely misreading a file header, it will be an easy fix. My only other complaint is that there's no support for FLAC, APE, and Apple lossless. Despite my bridling at the "SuperEasy" in the moniker, SuperEasy Audio Converter works well enough to warrant a look-see. The program ships in three flavors: the 20-Euro Premium edition with all the coded support listed above, the 15-Euro Extended version with the basics plus three other codecs, and 10 Euros for just the basics. The trial appears to be the Premium edition.